Where is the Bing Maps add-in for Outlook? The Bing Maps add-in for Outlook is part of Office, so it’s already on your computer. 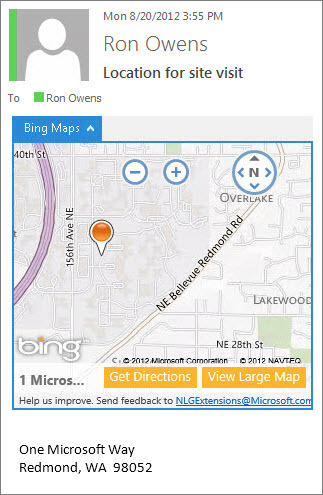 When you open an email message that has a street address, the Bing Maps add-in automatically appears in a gray bar near the top of the message. Note: If the Bing Maps add-in doesn’t automatically appear, your administrator might have disabled it or you might not be able to use Office add-ins for Outlook. To use them, you need Office 2013 or Office 2016 and Exchange 2013 or Exchange 2016, and your administrator needs to have enabled Office add-ins for Outlook. 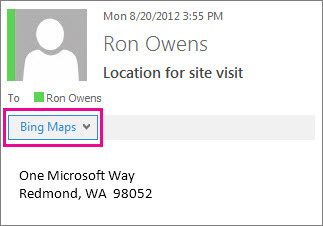 To see the address on a map, click the arrow next to Bing Maps.